A man by the name of Danilo says; "Mr. Leonard Alt, a sharp, articulate man like you who chooses to remain lost is such a waste of life for not recognizing the cult of Roman Catholicism that has enslaved so many gullible people... It is a cult and RCC is Satan's main weapon to lure worshipers away from God." Danilo, the false allegation against the Catholic Church, that it is some how involved in Satanism, is not new; this accusation actually goes back to the time of Jesus and the Apostles. In fact, Jesus himself was accused of operating by Satan. When Jesus drove out a demon, the Pharisees accused Jesus of driving out demons by Satan, "But when the Pharisees heard it, they said, 'It is only by Beelzebul, the ruler of the demons, that this fellow casts out the demons.'" Jesus said to them, "'If Satan casts out Satan, he is divided against himself; how then will his kingdom stand? If I cast out demons by Beelzebul, by whom do your own exorcists cast them out?' Therefore they will be your judges" (Mt 12:26-27). Not only was Jesus accused of Satanism, but members of His Church were accused as well. For example, the Pharisees said that John the baptist had a demon, "he has a demon" (Lk 7:33). And Jesus reminds us that we too would be hated, "If the world hates you, be aware that it hated me before it hated you" (Jn 15:18). Anyone can make an accusation against the Church founded by Jesus. The Christians, in the Bible, were not making the allegation of Satanism about one another. By making the accusation of Satanism, you are not quoting the words of Jesus in the Bible. You are echoing the words of the Pharisees, who accused Jesus of Satanism. “It is only by Beelzebul, the ruler of the demons, that this fellow casts out the demons.” Jesus said to them, "If Satan casts out Satan, he is divided against himself; how then will his kingdom stand?" If I cast out demons by Beelzebul, by whom do your own exorcists cast them out? What do you do in remembrance of Jesus? Have you unwittingly aligned yourself with Satan? Protestant confusion over the words "this is my body:"
How did the early Church solve issues where there is disagreement? The Bible way or the Bible alone apart from the Church! "Show it to me in the Bible!" Is the Bible Catholic? Show it to me in the 1611 King James Bible! Has the gates of Hades prevailed against your Church? What do you do in remembrance of Jesus? The Catholic Church, Eastern Orthodox, and some Protestant Churches celebrate the Mass. Every Mass is a reenactment of Jesus' Last Supper before Calvary. And we do this reenactment because Jesus tells us to in remembrance of Him. "Then he took a loaf of bread, and when he had given thanks, he broke it and gave it to them, saying, 'This is my body, which is given for you. Do this in remembrance of me'" (Lk 22:19). Jesus could have asked the Apostles to do something else, but He didn't. He wanted them to break bread claiming this is His Body; this is what he wanted the Apostles to do in remembrance of him. And now, of course, the next question is how often did they do this in remembrance of Jesus, in the early church? They broke bread daily in remembrance of Jesus. And on the first day of the week (Sunday) they also broke break bread. There was a daily (Acts 2:4-6) and weekly (Acts 20:7) breaking of the bread and this was how often they did this in remembrance of Jesus. Does your tradition allow for a daily and weekly breaking of the bread which was the Biblical norm? For those of you who are reading this, does your church do what Jesus commanded us to do in remembrance of Him? Or do you follow some other tradition that does not follow these words of Jesus? And do you devote yourselves "to the teaching of the apostles and to the communal life, to the breaking of the bread and to the prayers” (Acts 2:42)? Does your tradition allow for these Biblical traditions as expressed in the Bible? Satanic Mass done in mockery of the real Mass: Not every mass is a Mass that honors Jesus. Instead of doing this "in remembrance" of Jesus, some people (Satanists) perform what is called a black mass that is done in mockery of the words of Jesus and the Holy Mass which He instituted. In fact Satanists will steal consecrated hosts and desecrate them in their satanic masses. In Oklahoma City there was a satanic group who stole a consecrated host from a Catholic parish and planned to desecrate it at one of their Satanic Masses. Archbishop Paul Coakley filed a lawsuit, asking a judge to stop the desecration by requiring the group to return the stolen property. He indicated in the suit that the Host was to be desecrated in the vilest ways imaginable as an offering in sacrifice to Satan. In light of the threatened lawsuit, the group returned the consecrated host to the Church. Thanks be to God. Demon possessed man shows up at Mass: Msgr. Pope tells of an experience with a demon possessed man who was present at one of his Masses. "It was almost 15 years ago. I was at Old St. Mary’s here in D.C. celebrating Mass in the Latin (Extraordinary Form). It was a solemn high Mass. I don’t suppose I thought it any different than most Sundays, but something quite amazing was about to happen. As you may know, the ancient Latin Mass is celebrated “ad orientem” (toward the Liturgical East). Priest and people all face in one direction. What this means practically for the celebrant is that the people are behind him. It was time for the consecration. At this time, the priest is directed to bow low with his forearms on the altar table and the host between his fingers. As directed, the venerable words of Consecration were said in a low but distinct voice, Hoc est enim Corpus meum (For this is my Body). The bells rang as I genuflected. It was time for the consecration of the chalice. Again I bowed low, pronouncing clearly and distinctly but in a low voice, Hic est enim calix sanguinis mei, novi et æterni testamenti; mysterium fidei; qui pro vobis et pro multis effundetur in remissionem pecatorum. Haec quotiescumque feceritis in mei memoriam facietis (for this is the cup of my Blood, of the new and eternal covenant; the mystery of faith; which will for the many be shed unto the remission of sins. Whensoever you do this, you do it in my memory. Then, I heard another sound, this time an undeniable moan and then a shriek as someone cried out, 'Leave me alone, Jesus! Why do you torture me?' Suddenly there was a scuffling noise and someone ran out with the groaning sound of having been injured. The back doors swung open and then closed. Then silence. Have you unwittingly aligned yourself with Satan? Danilo, you accuse the Catholic Church of Satanism and mock the Church calling it a cult. What you don't realize is that you have something in common with the Satanists. You also are mocking the Church by calling it a cult and by falsely associating it with Satanism. I am not calling you a Satanist because you are not; however, because you mock Jesus' Church with your false allegations, you have unwittingly aligned yourself with the Satanists. It would be helpful to you if you actually sat down over a period of time and read a history of the Church and the early Church Fathers, some of whom even knew the Apostles. What you will find is that the Catholic Church is the Church of history going back to Jesus and the Apostles. This is the single major reason why so many extremely intelligent God believing Evangelicals are becoming Catholic. Danilo, I know this is a surprise to you; after all your tradition, (not the Bible) has taught you that the Catholic Church is false. When the Protestant reformers broke with the Church and tried to find their own way using the Bible Alone concept, they ran into theological anarchy. They all believed the Catholic Church was wrong in some way; however they could not agree with what is right. An Evangelical friend of mine said that she didn't like studying the Protestant reformers because it left her confused. The confusion had to do with the lack of common understanding of what the Bible was saying. There is this common myth among non-Catholics that the Protestant reformers were a united group of wonderful Christians coming against an evil corrupt Catholic Church. These people were anything but united. Protestant confusion over the words "this is my body:" One of the first things they were divided on was the Mass and what do Jesus words "this is My Body" (Mk 14:22) mean? Luther rejected transubstantiation; however; he "still retained the traditional interpretation, which said that Jesus was really present in the bread and wine by a bodily and objective presence - not dependent upon subjective feelings and considerations" (A Concise History of the Catholic Church - T. Bohenkottler. p. 199). Ulrich Zwingli's understanding was that we partake of bread of wine and remember Jesus; however, there was no unique presence in relationship to the elements of bread and wine during the service. John Calvin believed that Christ was present on top of the bread and wine. Calvin, in his understanding of "this is My Body" was actually trying to get Zwingli and Luther to come together. He did not succeed; he just came up with another version of what communion is all about. From the start they were a Kingdom divided. In reference to Holy Communion, Zwingli believed one thing, Luther believed another' and Calvin still another. This is why any attempt by non-Catholics to give the Protestant view on Communion or most other items of Protestant belief will meet with failure. The big question is this; why could they not come to common agreement among themselves? One of the things I hear over and over from Evangelicals and other non-Catholics is that we should do things "the Bible's way." I believe they are right in this and so let's see how they solved issues in the early Church using the Bible. How did the early Church solve issues where there is disagreement? The first major issue in the Church was the issue of circumcision. In Acts 15 there were certain individuals from Judea saying you must be circumcised in order to be saved. The Apostle Paul could have just consulted the Bible and made his own determination as many do today. However, he didn't do that. For one thing the Bible (New Testament) had not been written as yet. He consulted with the Apostles and the elders. "Paul and Barnabas and some of the others were appointed to go up to Jerusalem to discuss this question with the apostles and the elders" (Acts 15:2). After much debate Peter spoke up: "Now therefore why are you putting God to the test by placing on the neck of the disciples a yoke that neither our ancestors nor we have been able to bear? On the contrary, we believe that we will be saved through the grace of the Lord Jesus, just as they will” (Acts 15:10-11). James affirmed Peters statement; "Simeon has related how God first looked favorably on the Gentiles, to take from among them a people for his name. This agrees with the words of the prophets, as it is written... (Acts 15:14-15). The disagreement in the Church was solved in the first conference of the Church in Jerusalem. Peter's pronouncement still stands, and this is why the Church today does not require circumcision. The Bible way or the Bible alone apart from the Church! The issue was ultimately solved. "The Bible's way" is not consulting the "Bible Alone" apart from the Church with everyone making up their own minds. The Bible very clearly says they went up and consulted with the Apostles, Peter, and the elders, the authority of the Church. This is the Bible's way. A Baptist minister speaking against authority once said to me "I don't think I should have to follow what some man has to say." Well, if the minister was right then the Apostle Paul was wrong when he consulted men (the Apostles and elders in Jerusalem). Paul should have consulted "the Bible alone," but instead chose to consult men. Peter ultimately made the determination. The early Protestants had a major problem. Which understanding of Jesus' words "this is my Body" (Mk 14:22) is the correct one? They could have gone up to the authorities of the Church, using the line of Peter, and solved their problem. But they didn't do this for the obvious reason, that they had already separated from the line of Peter in their protest. Did they try any other line? No they did not! They opted for "Bible Alone" (Sola Scriptura), apart from the Church. They ignored "the Bible's way" by not submitting this issue to the legitimate authority of the Church, as was done in Acts 15. They are not partaking of the one body, the one same loaf because they could not solve the problem of what it was. "Because the loaf of bread is ONE, we though many are ONE body for we all partake of the SAME loaf" (I Cor 10:17). The Protestant reformers rejected the "the Bible's way" for their own way. They would not submit to the authority of the Church and as a result could not partake of the "same loaf." This was the beginning of theological anarchy in the Protestant experiment. They were a house divided and they exchanged "one body" for over 40,000 contradictory churches, denominations, non-denominations, sects, and fellowships all teaching a different Gospel. They knew their ABC's and would not accept a different gospel: Danilo, there are wonderful Evangelicals and others who knew their ABC's (Anything But Catholic) of their faith just as you do. They were people of faith and like Catholics; they very much wanted to know the truth. They knew about the Apostle Paul's warning and they wanted a church that presented the real Gospel as presented by the Apostles and Jesus; and they didn't want to be turning to a different Gospel by mistake. "Or if you receive a different spirit from the one you received, or a different gospel from the one you accepted, you submit to it readily enough (2 Cor 11:4; Gal 1:6). They were very sincere and they knew that all of these thousands of non-Catholic groups collectively couldn't be that one church because they were not all teaching the same Gospel. If there is such a thing as "one body" as spoken of in 1 Corinthians, which one of the many thousands of non-Catholic churches is it? This is the question they were asking themselves. These people wanted to be a part of that one Church founded by Jesus and the Apostles. And they knew it must be ONE because the Apostle Paul in the Bible said so. But if it is one of the more than 40,000, then which one is it? There is ONE body and ONE Spirit, just as you were called to the ONE hope of your calling, ONE Lord, ONE faith, ONE baptism, ONE God and Father of all, who is above all and through all and in all (Eph 4:4-6). How did the early Christians express their faith? They would pray and ask God for help in figuring this out. Then they discovered the history of the early Christians. In order to find out which one is the correct church with a line that goes back to Jesus and the Apostles they wanted to know how the early Christians acted out their faith. And to their dismay, they discovered that it was not one of the more than 40,000. When they began to study the early Church Fathers, some of whom even knew the Apostles or the disciples of the apostles they discovered a church that appeared to be Catholic. This was more than a little frightening and so their prayer changed. Now, they were not just asking God which Church is His one Church established by Jesus Christ; they also added, "please Lord don't let it be Catholic!" But of course it was Catholic and they began to fall in love with the very Church that they were taught to hate. "Show it to me in the Bible!" 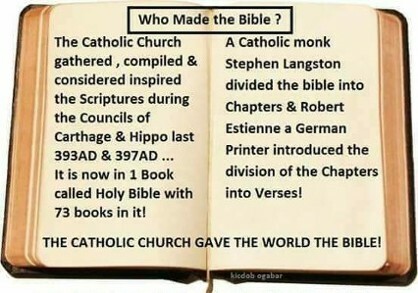 Is the Bible Catholic? Being Evangelical, they had a very high regard for the Bible. They began to study the history of the formation Bible. They discovered that the Bible (New Testament) was fully determined by the Catholic Church in the latter part of the 4th century. There are a lot of brilliant Evangelicals out there and when they see this, they stop their war against the Catholic Church. Even Fr. Martin Luther credited the Bible to the Catholic Church. In 1228, Cardinal Stephen Langdon, archbishop of Canterbury broke the Bible into chapter divisions. In 1536 the Italian Dominican priest Santes Pagnini made a new Latin translation of the Bible, he subdivided Langdon’s chapters into verses. In 1559, the French printer Robert Estienne, working in Geneva, adopted many of Pagnini’s verse divisions and modified others when he printed his editions. Non-Catholics will often times make reference to the Guttenberg press and Bible printing. What they won't tell you is that the very first book ever printed on this press was in fact a Catholic Bible, Latin Vulgate. There were 180 original copies of this Bible printed; 49 still exist today. “SHOW IT TO ME IN THE BIBLE!” He then tells about when he first realized that the Bible owes its existence to the Catholic Church. "I remember the strange empty feeling when I realized that the only reason that I have the Bible was the Catholic Church." Show it to me in the 1611 King James Bible! I have a copy of the original 1611 King James edition of the Bible and yes it is in print; you can order it from your local Protestant bookstore. The interesting thing about this Bible is that it has all the books. The deuterocanonical books were not removed from later editions of the Protestant Bibles until the early part of the 19th century. When I made this point, I had one individual mention that he had a 1611 King James Bible and those books are not in it. I didn’t disagree with him; I simply made the point that he did not have the earliest edition, but a later edition. When I wrote a defense of Purgatory, I was quoting word for word in 2nd Maccabees from this 1611 King James Bible. Non-Catholics will insist those books are not in there; however my 1611 King James Bible says otherwise. Has the gates of Hades prevailed against your Church? Danilo, I believe that you are a person of good intention and someday perhaps you will realize that it is futile too oppose the very Church that Jesus founded. After all, it was Jesus who said "And I tell you, you are Peter, and on this rock I will build my church, and the gates of Hades will not prevail against it" (Mt 16:18). You are not the first one to oppose the Church that Jesus founded, actually the Apostle Paul (Saul), in his spiritual blindness, was one of the first. Mathew 16:18 is one of those Catholic verses that Catholics explain and non-Catholics attempt to explain away. Here is a rock and Jesus is going to build his CHURCH on it and He also gives us a guarantee that the gates of Hades will not prevail against it. Every Catholic sees this Church as the Catholic Church. Some Protestants might disagree. However, I have never heard a non-Catholic argue that this Church, which cannot be destroyed by "the gates of Hades," is in fact their church. Why not? I believe it is because the moment that they say that they are the church of the promise, then they are not only at odds with the Catholic Church, but also with the many thousands of Protestant churches. If it is not the Catholic Church, then which church is it? They are not saying. If you believe that your church is that one true church that is built on a rock with the promise by Jesus that "the gates of Hades will not prevail against it," then please say so. At the same time, would you also explain how your church alone is that one church and the other more than 40,000 non-Catholic churches are not. And while you're at it, could you please show a history of your specific church going back to Jesus and the Apostles.